It really is a crime! It's the 3rd of September and I haven't stopped at my favorite fruit stand to pick up any amazingly yummy Utah peaches. More importantly, I haven't had the chance to sink my teeth into the most amazing peach pie ever! I can't remember the last time I allowed this to happen. Some of you may be saying, "It's not too late! There are still great peaches to be had." But with sadness I must face reality...and there is no way I'm going to have time in the next couple weeks to make pie. We're leaving tomorrow for Colorado to visit my brother and we won't be back until Tuesday. So why not next week?? I will be doing all the PR for Women's Expo while planning the greatest 1st birthday party ever for my baby girl...She's turning one...I can't believe it myself. Anyway, I didn't want peach season to pass completely without posting this "must have" recipe. 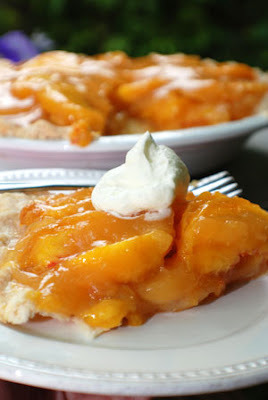 For those of you who can still make it to the peach stands, run and make this pie. You will not regret it!! Obviously, this is not my picture. No time to bake...not time to take. I borrowed this picture from www.beyondwonderful.com. At least someone had time to make fresh peach pie this season. 1. Toss the lemon juice and peaches with 1/2 cup sugar. 2. Allow to macerate (set) for one hour in the refrigerator. 4. In a sauce pan melt butter and cornstarch to make a rough. 5. Add the juice, ½ cup sugar, salt, and flavoring. 6. With a wire whisk blend until well mixed. 7. Bring to a boil stirring until thick. 8. Remove from the heat and allow to cool slightly; about 5-10 minutes. 9. Add the fruit and pour into a 10” prepared pie shell. Chill for 3 hours or overnight. 10. Serve with whipped cream or vanilla ice cream. For my favorite pie crust recipe, click HERE! Thanks Mindi for the recipe!! Saw you on KSL! Great job! Delicious! However, my sauce was plenty thick, but when I cut my pie it ran all over. ????? I've actually had that happen to me a couple times as well. Here are a couple tips. 1. Make sure the peaches are really well drained. If there is still a lot of juice left in them it will water down your glaze and the finished pie will be runny. 2. The glaze really needs to be super thick. I was so bummed it didn't get hot enough on Studio 5 so I could show just how thick it needs to get. It should be like the consistency of frosting or...think tooth paste. That's how thick it needs to be. 3. Also make sure your liquid is no more than a cup. If you want to make more glaze and you have more liquid, be sure to add more butter and corn starch. 4. Last...be absolutely sure to allow the pie a minimum of 4 hours to set up. Oh...one more thing. The finished pie isn't supposed to be super super thick. It will be a little runny. Kind of like apple pie. Mindi! I'm so excited to make this peach pie. I have the peaches in my fridge right now! I was going to make it tonight but decided I better wait until we get back from Moab. Will I see you there??? Love you!